Infrared night vision, 10 meters visible at night.Support Android, iPhone and PC monitor, wherever you can watch. 1080P HD, the resolution is 200Megapixel Circular image, the video and picture is more clear and smooth than 720P or analog camera. 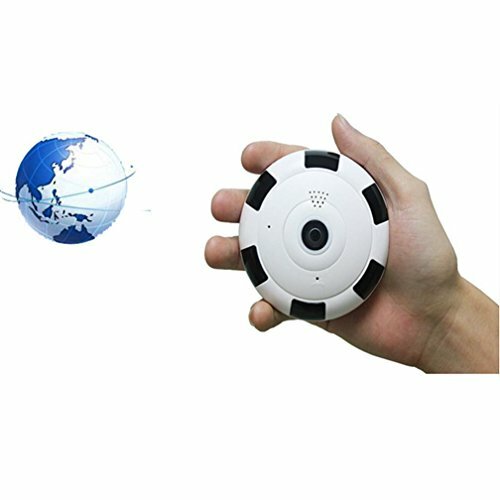 360 degree panoramic fisheye lens, just install 1pc panorama camera, you can view the whole room, equal to 5 or 4pcs normal cameras, and no dead corner. 3D view, just like 3D Movie, you can view the picture from different angle, it shows more real, clear. Two way audio, you can neet and talk each other, pick-up built-in. Internal WIFI antenna, just power on VR camera and and Wifi Router, it will connect automaticlly, can view by mobile, if you haven't Wifi NVR/Router, just connect through network cable, also can view on TV/Monitor.